I like to celebrate the month of December with flour dust on my hair and melted chocolate on my upper lips. There has not been a single day since the beginning of the month where my oven has had a day off. There have been biscotti, meringues, coconut macaroons, breads, granola, jam cookies, dried fruits bars, a decadent brownie and some out of this world chewy chocolate chip cookies (that I’m enjoying right now with a glass of milk). December has this baking bulimia effect on me. I pretend some excuses just so I can wear my chocolate-stained apron, turn on the oven and start playing with the flour. I’ve already had some pretty good motives like the traditional “neighbor’s gift baskets”, the “friend’s package Friday”, the “snowy Sunday”, the “chilly Saturday”, the “grumpy Monday”, the “oh-I’m-craving-chocolate-chip-cookies-Wednesday” and the “I-like-to-eat-brownies-while-watching-TheGodfather-Thursday”. You understand now how crucial it was to keep my oven active on December. Especially how watching The Godfather without having a square (or two) of brownies is a sin on itself. But the most sinful act of all would have been not to bake when I know that in two days we are off to Florida to spend the holidays with my in-laws. Traveling and family have this baking bulimia effect on me too. I believe the only day where I didn’t have to use my oven was the day I made this fantastic chocolate truffle trio. I’ve made chocolate truffles before, but when I made these I knew the previous one were pathetic. I owe this great success to Jacques Pépin and his easy to follow recipe. The method he uses is different from the usual chocolate and heavy cream truffle method. Instead he uses chocolate, egg yolks and butter. The recipe might seem long, but once you read it you will notice that it’s only precious advises from the chef himself to help you achieve a remarkable result. I followed his suggestions, divided the basic truffle recipe and flavored it with praline (hope you’re reading June! ), orange and coffee. If like me you don’t use alcohol in your cooking, you can always replace it by water as mentioned in the recipe. This won’t affect the texture of the truffles. You should really try these truffles. They are luscious and very addictive. Perfect to serve for guests, to give as a gift or just to treat your self on a chilly December. PS: Please don’t forget to make a donation to this year’s Menu for hope. There are prizes for every taste bud and it’s for a good cause. So go donate, right here. To make the basic mixture, melt the chocolate in double boiler (Bain Marie) until the chocolate is melted and lukewarm. Remove from the simmering water and add the egg yolks. Stir with a whisk for a few seconds. It will probably tighten and lose its shine. Add the butter in small pieces and whisk well. The mixture may become smooth or it may remain somewhat separated. Do not worry about it. Divide the basic mixture equally into three small bowls. For the coffee chocolate truffles: Add the coffee extract and rum and whisk. For the praline chocolate truffles: Add the praline and cognac and whisk. For the orange chocolate truffles: Add the orange rind and Grand Marnier and whisk. At this point the mixture should become smooth. If it doesn’t, add 1 tsp of hot water to each bowl and whisk until it does. It should not require more than 1 tbsp of water at most. Cover each bowl with plastic wrap and refrigerate for 2 hours. Get the truffles out of the fridge at least 15 minutes before starting shaping them. This way it will be easier to shape them. - With a small spoon, divide each mixture; in its own plate, into little balls the size of extra-large olives or smaller. Roll in the palm of your hands to smooth. Keep each flavor separate. 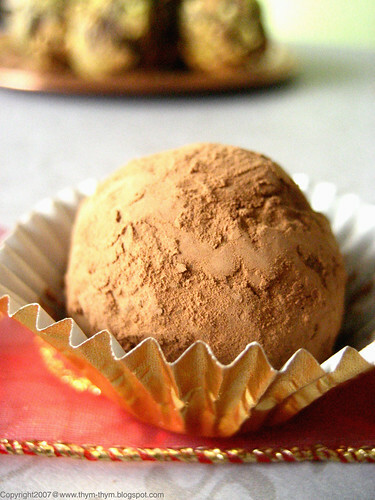 - For the coffee chocolate truffles, roll the balls in unsweetened cocoa powder. Shake the pan so the balls roll around and get coated. 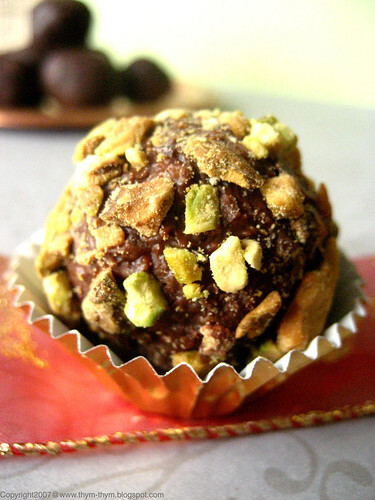 - For the praline truffles, roll the balls in roughly ground pistachios or silvered almond. 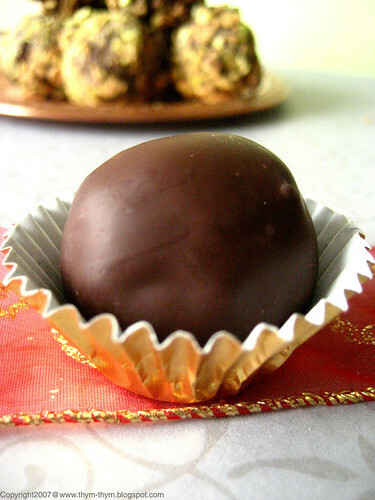 - For the orange truffles, once firm dip each one into melted chocolate. As you lift the ball out, roll it slightly on the side of the bowl to eliminate the excess. Secure the toothpicks in a piece of foam rubber or Styrofoam, or just a cardboard box so the chocolate drips along the toothpick. Let set until very hard, and then remove the toothpick. Arrange each truffle variety in a box. They will keep in the refrigerator for a couple of weeks. Serve at room temperature. Pour la recette de base, faites fondre le chocolat au bain marie. Hors du feu ajouter les jaunes d’oeuf et fouetter à l’aide d’un fouet jusqu’à ce que tout soit bien incorporé. Ajouter le beurre coupé en petits morceaux et fouetter encore une fois. Le mélange va redevenir brillant ou rester un peu granuleux. Ne vous inquietter pas. Diviser le mélange de chocolat équitablement entre trois petits bols. - Pour les truffes au café, ajouter l’extrait de café et le rhum au premier bol. Mélanger avec un fouet. - Pour les truffes au pralin, ajouter le pralin et le Cognac au deuxieme bol. Mélanger avec un fouet. - Pour les truffes à l’orange, ajouter le zeste et le Grand Marnier. Mélanger avec un fouet. A ce stade, chaque mélange devrait redevenir brillant. Si ce n’est pas le cas ajouter 1 c.c d’eau chaude au mélange qui en a besoin. Mais pas plus d’une c.s d’eau chaude. Couvrir chaque bol de film plastique et mettre au frais pendant 2 heures ou jusqu’a ce qu’il soit ferme. Sortir les bols au moins 15 min avant de les travailler. Avec une cuil a café, faire des petits tas des differents mélange de la taille d’une grosse olive ou plus petit. Mettre chaque differentes truffes (café, orange et pralin) sur leur propre assiette. Rouler les differents truffes en boules. Mettre des cure-dents dans les truffes à l’orange et mettre au congélateur pendant 15 min ou jusqu’a ce qu’elle deviennent fermes. Pour les truffes au café, rouler-les dans du cacao amer. Pour les truffes au pralin, rouler-les dans des pistaches grossierement hachées ou des amandes effilées. Pour les truffes à l’orange, tremper chaque truffe dans du chocolate fondu, et remonter les truffes en les rouler llegerement sur le bord de la casserole afin d’enlever l’exces de chocolat. Sécuriser-les sur du polystyrene ou une boite en carton afin que le chocolat coule le long des cure-dents. Laisser de côté jusqu’à ce qu’il devienne ferme et enlever les cure-dents. Mettre les differentes truffes dans des boites et les conserver au frigo pendant des semaines. Servir à temperature ambiante. Oh la la Rose. I am drooling over your truffes. The recipes are interesting with the use of eggs to make the ganache. How do they differ from the regular truffes? Thank you for this post I have been thinking about trying my had at truffles for the first time this holiday season. I have been baking a lot too but not as much as you because of school and now we are all sick. If it is not one thing it is another. these look great and I have a lot of faith in Jacques Pepin's recipes and direction, he is one of the good ones. Have a great time in Sunny Florida. Totally delectable....How I wish I was living in your kitchen! Absolutely beautiful! These look delectable and I want to try them all! - Christine, merci beaucoup ma cherie. I find this recipe lighter in texture and fondant than the regular truffles (which I find dense a little bit) and when you get them out of the fridge to come at room temperature, they become soft pretty quickly than the regular ones. Overall, I think I'm gonna stick with Jacques pepin's truffles. - Shayne, I am glad you like them. I love the texture of the truffles and that with one basic mixture you can have three different varieties. Jaques pepin is The Chef by excellence and his book is fantastic. A real treasure. Get well soon my friend. - Prettybaker, thank you my dear. I would be glad to have you as my "truffles Taster". Have a happy weekend. - Gretchen, thank you very much. It's very hard to choose, I know! Amazing! Truffles have been on my "really must get over the fear and try it" list for years. I'm not sure when I'll actually get to it, but this post is very inspiring! Praline Cognac, oh my! What a wonderful new flavor for me to try. I love your baking frenzy and especially the Godfather defense - I shall use it myself! Your truffles look as beautiful as any I have seen in the chocolatries around here. Nice work! I so can relate to your baking extravaganza. Sounds like you would have been a welcome guest at our recent cookie swap! - Maria, Thanks my dear.And I'm sure your oven missed you too. Go give him some love this weekend. - Ann, thank you very much. Truffles have this reputation of being complicate dto make, but in fact they are very easy. Just melt, chill and roll. Hope you will make them some day. - Amanda, glad you like it. You can never go wrong with Jacques pepin. The thing with Godfather is that when I watch it, I thimk brownies. I don't know why! - Nabeela, nice to have you back my dear. Thanks for your sweet words. I like to spoil them. They are all what's dear to my heart. What's really delicious here are your photographs! Unless you're preparing these for teetotalers, do use the alcohol, not water--it will give these beautiful treats a nice complexity. What a lovely blog! Jacques Pepin is one of my favorite chefs. He talks to you instead of preaches. I'm definitely going to try these truffles. Lately I have trouble whenever I try to melt chocolate, I can't get the right temperature. Merci Rose pour cette magnifique truffe! - Mima, merci beaucoup me tendre mima. Je te reserve de belles truffes pour le jour ou on se retrouvera tous ensemble.On passe de tres agreables moment ici. bises. A tres bientot. - Terry B, thanks a lot. The little nephews enjoy them very much. - Mary, thank you very much and welcome. Jacques pepin makes things look so easy and delicious that you just can't help it but love him. Merry Christmas to you. - Brilynn, thank you. Good luck with the chocolate. I know it can be a pain in the neck sometimes. - Claude, je livrerai mes truffes a domicile le jour ou tu livereras tes truffes au cardamome. Deal! - Stanislas, je suis contente qu'elles te plaisent. - Deborah, thank you very much my dear. Rose these look so cute all nestled in those pretty cupcake papers! Not only do they look cute but I am sure they taste wonderful! Hope you had a good time in Florida! I just got back from a snowy trip to Ohio and am glad to be back in the sunshine state! Wishing you and your family a very Merry Christmas Rose! yum! i just made truffles for the first time last week! Merry Christmas, Rose. I hope that you and your family will have a wonderful day and also best wishes for 2008. Qu'est ce qu'elles sont belles! Pour moi ce sera au pralin. Gosh those look good! I'll have to try them soon. Thank you for the recipe! these are delicious! thank-you for the recipe, I have made little bags of these for loved ones to gives as easter presents. absolutely delicious!!! - What a sweet treat, and what a sweet person you are. I'm so glad you liked them! This is the perfect recipe. I am going to make them for my nana for Christmas. She will love them! It's just cocoa powder.The color just happened to be lighter than most brands.